In the mid-1980s, the 767 spearheaded the growth of twinjet flights across the northern Atlantic under extended-range twin-engine operational performance standards (ETOPS) regulations. In truth the aircraft has always been overshadowed by the larger and more glamorous 747, and then overtaken by the commercially attractive 777, which is certainly wider – 20ft 4ins v 16ft 6ins. Interior cabin noise-wise there is nothing in it. The latest 400ER with around 300 seats fits in very nicely with fleet planning and is, in the case of Delta, an excellent aircraft to travel in. Regulars would argue that with less seats than a 777 it is easier to get on and off, and less people at immigration and security. The Airbus A330 came 10 years later and (mainly due to Airbus indecision on the 350) has now outsold the Seattle aircraft. At 18ft 6ins it is wider, tempting operators to go for 2+2+2 (1+3+1 also) rather than the DL 1+2+1, one of the best layouts around. From Heathrow DL currently operate three times daily to Atlanta, three times to Kennedy New York and daily to Boston using T4 and offering the Skyteam lounge for eligible customers. In my opinion, whilst still not quite completing its upgrades, it is currently the best terminal on the airport. It is quieter and the roadside access particularly easy. The swop around when T2 opens should make no difference. 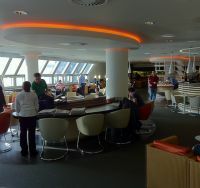 The Skyteam lounge is a two-level affair providing spa facilities and hot food. The walk to the gate is never that far. Boarding is quick and Delta has now introduced a Redcoat service which means the senior check-in staff relocate to the aircraft in order to make sure that their premier class customers are nicely settled in before departure. 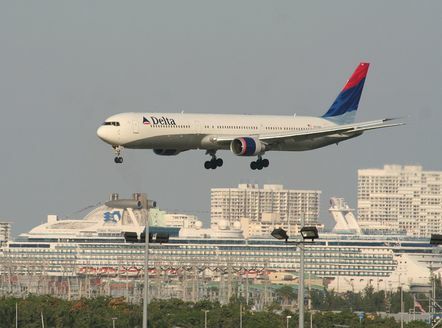 Unlike some carriers Delta do not use handling agent personnel who are often unfamiliar with the aircraft. In any event, once on board the cabin staff dispose of jackets in the wardrobes provided and offer Champagne (and Bucks Fizz/Mimosa) or orange. The menu comes around, orders taken, also a hot towel is offered. You are made to feel very welcome. 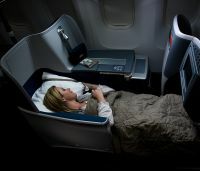 Last year Delta introduced an all new BusinessElite cabin for its long-haul 767 services and they have really got it right. Maybe it is experience, but there is little to criticise with an easy-to-use lay-flat seat 6ft 0ins long and 18.5ins wide. The folding table is stored in a wide the arm rest unit, which offers plenty of room for drinks and snacks. There is a very simple-to-operate digital TV (perhaps an increased film selection could be incorporated and less US focused TV. On the transatlantic sector 50% of passengers originate from Europe. More than adequate storage space including a specially designed shoes shelf. A nice detail. Please note that under US Department of Homeland Security rules one is not now allowed to take a stroll around the back of the aircraft for exercise. You must stay in the BusinessElite cabin. However the seat does include a back massage and every BusinessElite passenger has direct aisle access. You can choose the time you wish to dine but out of London on the first departure of the day (the choice is 09:45, 12:30 or 14:30 for a 9.5 hour flight) cocktails and nuts are offered soon after getting airborne. The meal service, designed by Consultant Chef Michelle Bernstein, offered a starter of gravlax and Asian pear slaw and tomato and basil soup, followed by mixed green salad. For the main course there were four choices, including vegetarian. You can of course book ahead a special diet. The finish (or dessert) included a fine variety of cheeses, ice cream with nuts and sauces, and chocolate covered profiteroles. The wine selection consisted of two white and two red, and one could finish up with a (lovely) Port, Semillon, or the inevitable Champagne. Fresh fruit and snacks were available throughout the flight and the cabin staff were constantly on the prowl. A nice cup of tea and a sandwich half way across was perfect. Prior to landing what best could be described as an excellent afternoon tea was served. Regulars to Atlanta will be please to learn that with the opening of the new international gateway called Concourse F (see last week’s issue) travellers do not have to go through domestic security nor the long ride to the landside area. The all new 42 position passport control works very well. It is very quick whether connecting (7m of the anticipated 10m passengers this year from all over the world will change planes) or making for Atlanta and its surrounding area. The return journey was much the same. The excellent lie-flat seat was used and a fine duvet provided. The meal service again was top quality and a hot breakfast served for those who wanted it. European citizens were fast through Terminal 4, although the queue for the rest looked depressing. A Fast Track pass was provided, but not used, and the Yotel cabin facility offered for a shower and tidy up. From being a minor player across the North Atlantic, based at Gatwick, Delta has come a long way and is now a very serious competitor to American Airlines, British Airways, United Airlines and Virgin Atlantic. Its pricing is attractive too and with Atlanta offers the best connecting airport in the world. An upgrade of its Kennedy facilities is under way with completion due in less than 12 months. The new Concourse F is large and airy and will win awards. If offers a great deal for Economy Class passengers. However all is not perfect. Delta needs to think out its policy regarding its Skyclub Lounge. Hot meals are provided at Heathrow. At Atlanta it offers fine accommodation including showers and plenty to drink. But nothing to eat. Business Class passengers, particularly those connecting, do not want to have to use the many fast food outlets provided in the terminal itself. Or go to Terminal E where there is even more. This needs to be put right for New York. It will actually save the airline with in-flight catering on late night flights.